More Jordanian and Iraqi children suffering from the uncomfortable and distressing cleft lip and palate condition will benefit from free surgery to correct the problem, thanks to the local branch of the international NGO, Operation Smile (OS). “We are constantly seeking ways to expand our operations and capabilities. The next Operation Smile mission will be in July 2005 and will be a Jordanian/Iraqi mission,” Manal Wazani, executive director of OS Jordan (OSJ), told IRIN in Amman. A cleft lip is a gap or split in the upper lip and a cleft palate is a gap in the roof of the mouth. The cause of these medical conditions, which occur during pregnancy, are the subject of continuing research. Ismael Ibrahim, 36, who had a cleft lip and palate, had lost faith in the local health system, after having several failed operations to rectify his disfiguring condition. When he learned about OSJ, through surfing the internet, he decided to try again. He was contacted by OSJ in 2004 and asked if he wanted to accept their offer of another operation and decided he would. “My life has changed considerably after the operation,” he told IRIN in Amman. “People can finally understand me when I speak. My main problem was that my speech was unintelligible and I can finally express myself by talking, rather than by signalling with my hands and writing notes on pieces of paper,” he added. OSJ medical volunteers have been providing free surgery and related health care to needy children and adults in two Jordanian cities since October 2000 and is now planning to send missions to other parts of the country. The medical charity is also working with Iraqis. According to OSJ, the incidence of cleft lips and palates in developing countries is approximately one in every 500 births. Wazani said there are no reliable statistics on the number of cleft lip and palate cases in Jordan. But according to unofficial statistics collected by medical researchers, the rate is 1.39 per 1,000 live births. This data was collected between 1991 and 2001 from hospital surgical records. The information showed a higher prevalence rate for boys, at 55 percent of the total, than for girls. It also revealed that cleft conditions among Jordanians were similar to the prevalence rate in Caucasians. A study is currently being conducted by OSJ to compile accurate statistics on the number of cleft cases in the kingdom. OSJ also trains local medical professionals and assists in building an infrastructure to help treat even more children. “Three Jordanian doctors are participating along with 55 other doctors from around the world in the Physician Training Programme (PTP) in the US, that trains them to use the best medical practices and technologies,” Wazani said. The mission arriving in July will also allow Jordanian doctors to share experiences and expertise with the visiting doctors. “It is an educational visit that will help OSJ in the setting up of the multi-disciplinary cleft centre that is planned to open here in 2006,” she explained. Although there is no risk of loss of life if a cleft lip or palate is not treated, children born with the condition suffer physically and emotionally. “They can suffer a multitude of medical problems including ear disease, chronic ear infection, malnutrition, dental problems and difficulties with speech development,” Wazani said. 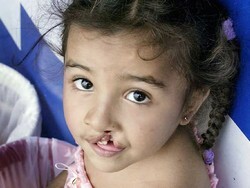 OS international has been operating on children with cleft conditions in developing countries for 20 years. To date, 85,000 children have undergone surgery with their help.